...if I could play on a course like the one in Austin's huge and beautiful Butler Park. We drove past the Butler Park Pitch and Putt during a trip to Texas last week. It's a nine-hole, par three course, close to the city's downtown. The entire course is only 805 yards. It's ideal for families. It's real golf, literally a miniature golf course, with drives off the tees, short fairways, and no windmills. According to recent research, the growth of some types of brain cancer are accelerated by thinking. ...maybe not. A report from a British medical team says that exercise is useful for fending off heart issues and dementia, but if you really want to lose weight, lay off the calories. The plea of the late Rich Mullins that the country he loved would come to trust in the God revealed to the world in Jesus Christ..
A challenging and important song from an evangelical Christian about the homeland he loves and is aware of its diversity, promise, and challenges. This song enjoyed a resurgent appreciation when Cole's daughter, Natalie, recorded her successful LP featuring "duets" with her late father. Nat Cole began his career as an accomplished jazz pianist. But with his smooth voice and memorable phrasings, he became a popular vocalist. He was the first African-American to host his own network TV show in the US. Along with Frank Sinatra, Nat "King" Cole is my favorite "easy listening" crooner from the 50s and early 60s. This song conveys the stunned incredulity of a man in love with an unforgettable woman, overwhelmed by the fact that she loves him too. It never loses its power or sweetness. 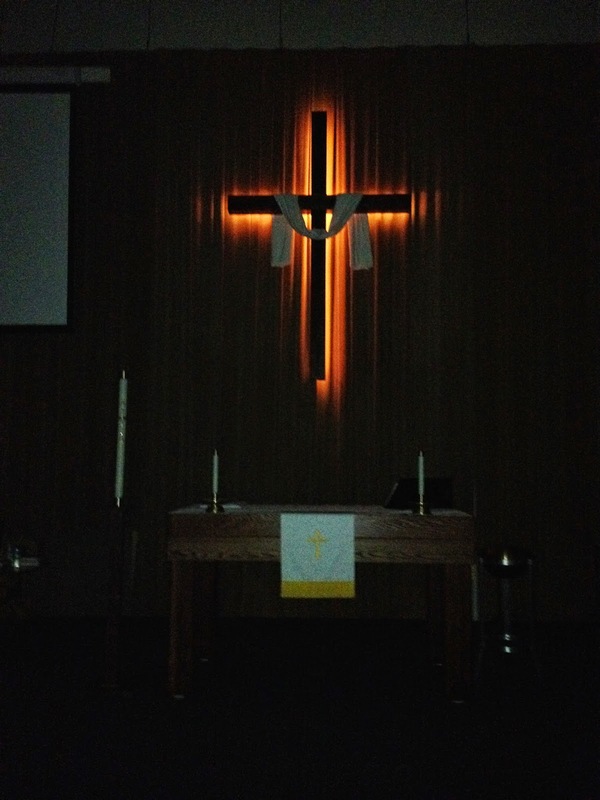 What Is It About the Cross? About three hours ago, I posted this picture, taken in our church's sanctuary after a meeting had just ended, on Facebook and in the time since, fifty-six people have "liked" it. Why is that? Well, the image is pretty, I suppose, even in a sanctuary made from a school gym. The prettiness at sunset in a darkened sanctuary is part of what led me to snap the picture. But the real reason, I think, is the cross. For many--half the people of the world and growing, making Christianity the fastest growing religion in the world, the cross is the definitive symbol for our beliefs as followers of Jesus Christ. For others, there is often a visceral, if unacknowledged, understanding of the cross. Or the stirrings of such an understanding. Jesus, pure, sinless God and man, died on the cross, taking the punishment for sin that every human being deserves. The cross demonstrates then how hopelessly lost and eternally dead we are unless we repent (turn from sin) and trust in Christ as our God, King, Lord, Savior. The cross demonstrates just how consequential our inborn sinfulness and our individual sins really are. In bearing our sin, Jesus experienced just how it alienates us from God. Has there ever been a more poignant prayer than that of Jesus, quoting Psalm 22 and asking the Father imploringly, "My God, My God, why have You forsaken Me"? Sin' s power over our lives is only destroyed by what Jesus Christ voluntarily bore there and by our openness to the work of the Holy Spirit working the miracle of repentance and faith within us. The cross demonstrates not just the depth of our alienation from God, it also demonstrates the height of God's love for us. The cross demonstrates that the only way to a life free of sin and of sin's consequence, death, which was bred into the human gene pool the moment that our first parents, Adam and Eve, fell into sin, is to acknowledge our sin and our need of the conqueror of sin, Jesus. We must own the reality of our sin and to submit to the death of our sinful selves so that, like Jesus, we may rise to new life. This is what Jesus is talking about when He says that anyone who would be His disciple (His follower, His student) must take up their cross and follow Him. Popular legend has reduced these words of Jesus in Luke 9:23-26 to referring to bearing life's difficulties. "Everyone has their cross to bear," people will say when speaking of their life's challenges. But that is NOT what Jesus was talking about when He said that to be His disciple, we have to take up crosses and follow Him. What He WAS saying is that, in order to have a share in Jesus' resurrection from the dead, we must also submit to the crucifixion of our old sinful selves. The cross is also then the way to life with God. It's a life we can enjoy in this world, though it's obscured by the reality of sin and death on this planet, including our own sinful and death-tinged ways and impulses, meaning that we must live in daily repentance and renewal until the days we die. And this is a new life we will enjoy fully and perfectly in eternity with all who have endured in trusting in Christ as their only hope. And so, the cross is a symbol of life and hope for all who don't deserve life or hope, sinners like me. It's a symbol of God's grace--His undeserved favor and love. God won't force life and hope on anyone. But if we will receive Christ by faith, acknowledging our need of Him and our surrender to Him, He will give us these gifts--and many more--now and in eternity. Through the cross of Christ, God stands ready to give us what we need more than anything, a relationship with, a connection to Himself, the only giver of life that exists in the universe. The cross demonstrates how hopeless human life is without God. The cross demonstrates the height of God's love for us, sinners though we are. The cross demonstrates that in order to have new life with God, we must submit to the crucifixion of our old selves and all its selfishness and self-centered ambitions. The cross is the way to life with God because when we trust in Jesus, the risen Savior, we have the life-giving promise that God can make us new today and finally, fully, totally new in the life to come. The cross--the crucifixion of me, my selfishness, my arrogance, my insistence on being right, my insistence on being in control of my life--as the way to life is the most difficult thing to accept about Christianity. It's also the most counterintuitive from the standpoint of human instinct and human ego. The way of the cross is not the way to get ahead in the world. The New Testament calls Christianity's teaching about the need for each of us to take up our crosses and follow a crucified Savior, a "scandal" in the eyes of this world. It seems foolish. 20 ...Has not God made foolish the wisdom of the world? 21 For since in the wisdom of God the world through its wisdom did not know him, God was pleased through the foolishness of what was preached to save those who believe. 22 Jews demand signs and Greeks look for wisdom, 23 but we preach Christ crucified: a stumbling block to Jews and foolishness to Gentiles, 24 but to those whom God has called, both Jews and Greeks, Christ the power of God and the wisdom of God. 25 For the foolishness of God is wiser than human wisdom, and the weakness of God is stronger than human strength. Twenty-one centuries after He died and rose, Jesus' cross is still a scandal. His way still seems foolish. But it's still the only way to life. And somehow, deep down, we know it. That's why the cross stills fascinates us. What Other Facts Just Aren't Facts? Not making a political statement here, but that's the question this news story brought to mind today. So many things we (I) assume to be "facts" may not really be factual. It's a matter of staying open to being teachable, I guess. I Need You appeared as part of the soundtrack of The Beatles' second film, Help. I love the sparseness of the arrangement, typical of the band's early work. The arrangement, of course, includes background vocals in which Lennon and McCartney, as usual, harmonize beautifully. (Their harmonies are among the things that set The Beatles apart from their contemporaries. To this day, their harmonies on Abbey Road, their last studio LP, though Let It Be was released after the former project, blow me away.) The Beatles' version is the first video below. The version by Tom Petty and the Heartbreakers comes from the tribute Concert for George, which took place in 2002. If anything, Petty's version is even sparser than the original. Petty's voice isn't as "pretty" as George's, but somehow by its relative thinness, conveys even more of the poignance and plaintiveness of the song than Harrison managed when he first recorded it at the age of twenty-two. Generally, I'm not a fan of cover versions, but this one is beautiful and truly affecting.